Join me, Christine Arylo, for a conversation I feel SO passionate that we as women leaders and mothers need to be having. For ourselves and all of the children of the world. Why do so many of us smart women sabotage ourselves when it comes to relationships? And as a result sacrifice what we need, or sacrifice or dreams and desires. Or settle for less in our partnerships and friendships? Or put up with non-respectful and relationships with our relatives or at work? 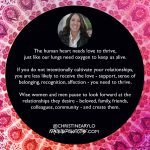 How can we be good at our jobs and rock our careers, yet struggle in the realm of love and the heart? And how do we find the wisdom to create the strong, beautiful, supportive partnerships, friendships, family, community that we not only desire but that we actually NEED to have the impact we desire and be supported and cared for and sustained. 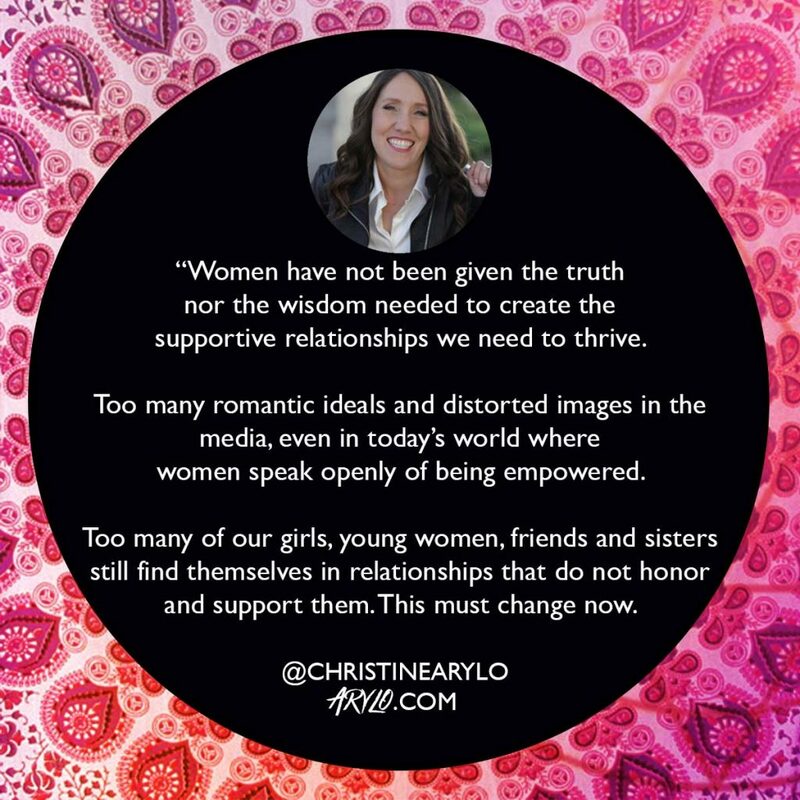 Women have not been given the truth nor the wisdom needed to create the supportive relationships we need to thrive. Over my life and my work with amazing, strong, good hearted women, I noticed that we have been sold a bill of goods about love and relationship that is just plain WRONG. What we are taught to expect, how we see ourselves and others, how we show up in them, what healthy relationships look like is in so many ways warped and distorted, not powerful and wise. The cost of this is huge. and deep human need to feel loved, safe and cared for. If we as grown women do not know how to cultivate healthy relationships that support us to thrive, how can we expect the children we raise or the young people we influence to grow strong on the inside to have only respectful relationships? In 2009, I wrote my first book, Choosing ME Before WE, because I just could not watch another woman suffer in her relationships. In 2015 I started the Path of Self Love School to teach women and girls and now men and boys the wisdom I never got growing up but that we all need. And the tools to understand how to work with my own heart so all my relationships could support me to soar. 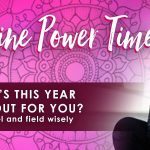 This month, I felt inspired to create a 4 part Feminine Power Time for you on LOVE and Relationships. Nor sustain ourselves if we don’t have a diverse and deep circle of relationships that support us. And we cannot afford to distract or drain ourselves in unhealthy relationships in any part of our lives. a heart to heart on this essential part of our feminine power and wisdom. The ones to come will include guests to take us deeper into different realms of love and relationship – your LOVE LIFE includes much more than ‘romantic relationships’. I will share my personal story about relationships and how it became my catalyst and saved me from creating a life and career that wasn’t what I really wanted. I’ll do a short reading from Choosing ME Before WE that rocked my world and opened the door to self forgiveness for my relationship choices. We’ll stop and reflect on how these misunderstandings are showing up in your life or in those you love. An amazing beginning to this series. So true about self-love, and recognizing what is a toxic relationship vs. a loving relationship. I have experienced toxic relationships too many times until I woke up and knew in my soul there was a better way to live. Now, I encourage women and teen girls to find self-love so they have true meaningful relationships. Lynn – THANK YOU for the work you are doing in the world with women and girls. Sadly still there are TOO many women and young girls who are not given the guidence they need to only choose loving relationships. But self-love is the answer, we know that. Now we just need to get that medicine to as many as possible. Much love. Error: Error validating access token: Session has expired on Friday, 19-Apr-19 12:24:14 PDT. The current time is Thursday, 25-Apr-19 10:49:12 PDT.